Ulla Johnson Aurora Bag Now Available on Beauty.com! Beauty.com®, a division of drugstore.com, inc., is excited to introduce an exclusive cosmetic bag from lauded fashion designer Ulla Johnson as a complimentary gift this summer. Beginning today, customers will receive the product-filled Ulla Johnson Aurora Bag when they spend more than $100 or more at the prestige beauty retailer. The boho style makeup bag and its contents can be found at http://www.Beauty.com/UllaJohnson and is available while supplies last. With temperatures rising and summer vacations underway, the Aurora Bag is the ideal accessory for all customers whether they are jet setting to a faraway beach or planning staycations at home. The zippered bag boasts a pretty boho purple print with Ulla Johnson’s signature tassel embellishing the zipper pull. Filled with a selection of skin care, SPF and makeup items, this bag makes for the perfect summer gift for shoppers. 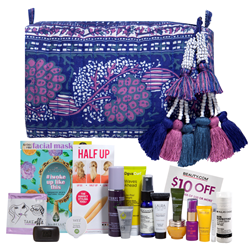 While looking to reach the $100 hurdle to receive this unique, boho makeup bag, customers can get summer-ready by shopping an assortment of new SPF products from top brands including; Brush On Block, Dr. Russo Sun Protective Skincare and Let it Block. New offerings from Smashbox, NARS and Tarte will help customers achieve any summer beauty look this season. For inspiration on pretty summer beauty looks, Beauty.com is a great resource for seasonal makeup, hair and nail trends. On the Advice & Trends page, customers will find step by step guides to achieving runway-inspired looks. In the Beauty.com video library, new content including contouring how-to’s and tips on summer skin care prep is added monthly. Other great site features include Guest Editor pages, My Life in Beauty features and the Beauty.com blog, Beauty Close Up. As always, Beauty.com offers great benefits to shoppers including “Everyday Complimentary Shipping,”** 5% back on every purchase with drugstore.com dollars™**, speedy shipping, the complimentary sampling center, 100% satisfaction guarantee***, and a shared online shopping cart with the Beauty.com partner site, http://www.drugstore.com. Beauty fans can also get the latest tips, trends, and promotions sent directly to their email by signing up for the complimentary weekly Beauty Bulletin on the Beauty.com site. **Complimentary standard shipping is available only on purchases of $35 or more, and does not apply to gift cards/certificates, bulk orders, or orders over 20 pounds. With drugstore.com dollars™, customers receive a credit to their account equal to 5% of any eligible purchase. Customers cannot earn or apply drugstore.com dollars™ to gift certificates, gift cards, discounts, complimentary items, past purchase, or non-shipped, undeliverable or returned items. drugstore.com dollars™ cannot be redeemed for cash. These offers are only available on the http://www.drugstore.com and http://www.Beauty.com web sites. These offers are not available on partner sites such as Walgreens.com and VisionDirect.com. ***All Beauty.com purchases are backed by our 100% satisfaction guarantee. If you are not satisfied with an item you have purchased from Beauty.com, you may return it within 30 days of the date it was delivered and receive a refund or in-store credit. Certain items, such as jewelry, purses, and intimate apparel, can only be returned for refund or credit if unworn, are in original packaging and have any original tags still attached. For 15 years, drugstore.com has been a leading online provider of health, beauty, and vision products. Shop a great assortment of more than 80,000 items ranging from everyday basics to hard-to-find favorites. With competitive prices, unique categories and complimentary shipping for orders over $35 all in one convenient location, the drugstore.com web store is truly the uncommon drugstore®.